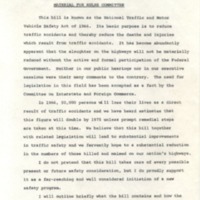 During its second session, the 89th Congress took up the issue of comprehensive traffic and motor vehicle safety for the first time. 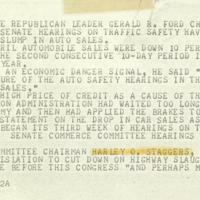 Previous congresses had addressed some traffic safety issues in limited ways. 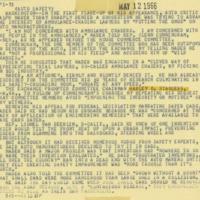 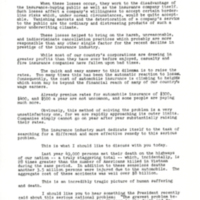 However, a National Safety Council report estimating that automobile accidents resulted in 49,000 deaths, 1.8 million minor injuries, and $8.5 billion in damages, lost wages, and medical expenses in 1965 alone and the November 1965 publication of consumer activist Ralph Nader’s Unsafe at Any Speed, which charged automobile manufacturers with placing style over safety in the name of profits, fueled popular calls for congressional action in 1966. 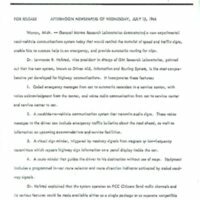 Auto industry giants, including General Motors, Ford, Chrysler, and American Motors, initially resisted these developments, arguing that driver error and poor road conditions, not their cars, were to blame. 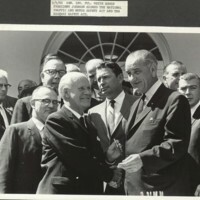 President Johnson waded into the highway safety debate in early 1966, throwing support behind congressional action in his 1966 State of the Union address and subsequent speeches. 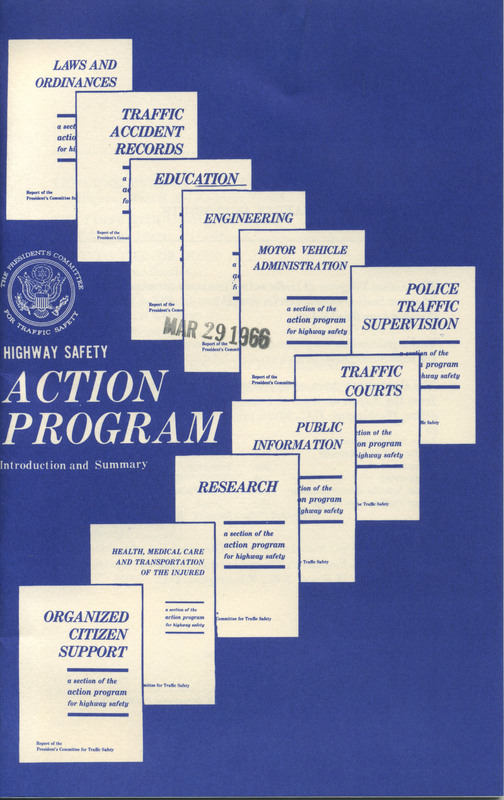 In his March 2, 1966 transportation message to Congress, the president called for the rapid passage of a six-year, $700 million Traffic Safety Act that would include grants to states for the establishment or expansion of comprehensive highway safety programs, the expansion of federal highway safety research, and the improvement of automobile safety performance. 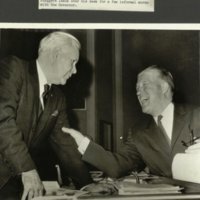 That same day, West Virginia Representative Harley O. 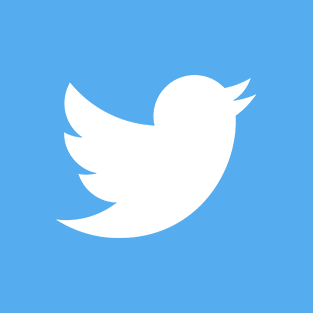 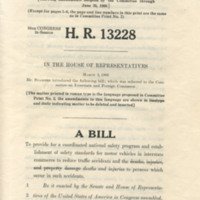 Staggers (D), chairman of the House Interstate and Foreign Commerce Committee, and Senator Warren Magnuson (D-WA), chairman of the Senate Commerce Committee each introduced administration bills on traffic safety, HR 13228 and S 3005. 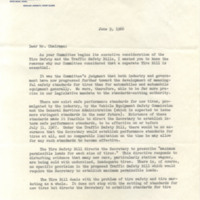 During the ensuing Senate Commerce Committee hearings, Senator Abraham Ribicoff (D-CT) criticized the administration bill for granting only “discretionary” authority to implement safety standards. 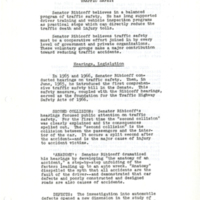 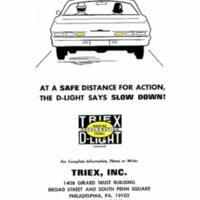 Ribicoff argued for the creation of mandatory automobile safety standards to be implemented and enforced within one year after their establishment. 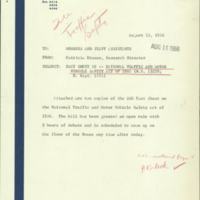 Despite auto industry opposition to the strengthening measure, the committee reported S 3005 with an amended Title I on June 23rd. 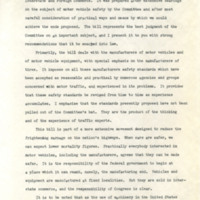 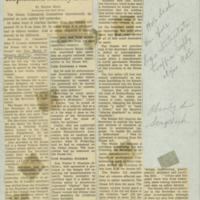 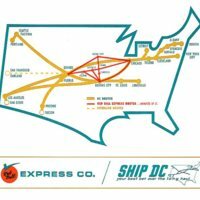 The approved amendment required the Secretary of Commerce to establish interim safety standards by January 31, 1967 and revised standards by January 31, 1968. 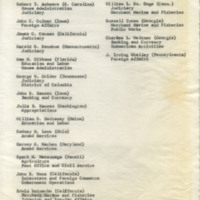 One day later, the Senate approved the amended bill by 76-0 roll-call vote. 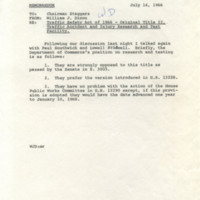 The House Interstate and Foreign Commerce Committee reported an amended HR 13228 a month later, on July 28. 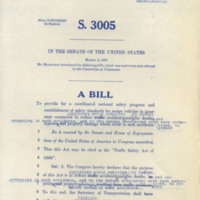 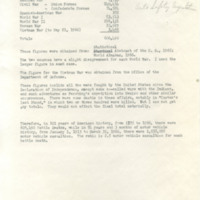 The House bill also contained strengthening amendments, including a stipulation subjecting all trucks and buses already regulated by the Interstate Commerce Committee to the mandatory safety standards and a provision directing the Secretary of Commerce to also develop uniform safety standards for all used vehicles. 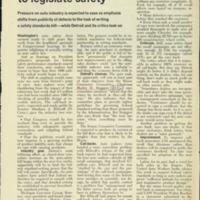 On August 17, the House passed HR 13228 with amendments by 371-0 roll call vote. 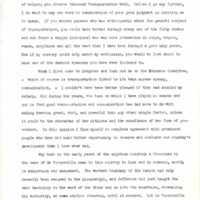 Following the House and Senate approval of the conference report on S 3005, President Johnson signed the National Traffic and Motor Vehicle Safety Act of 1966 into law on September 9, 1966. 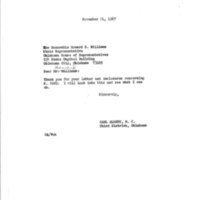 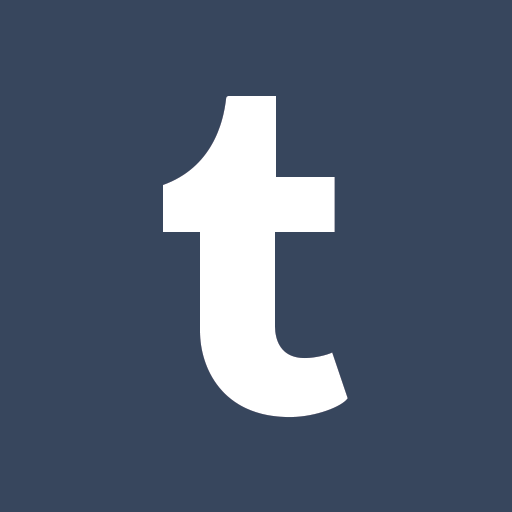 The new law was much more stringent than the initial administration bill, and it reflected the focus on consumer protections that was apparent in much of the Great Society legislation. 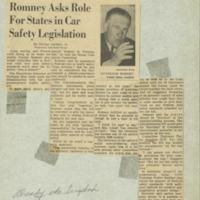 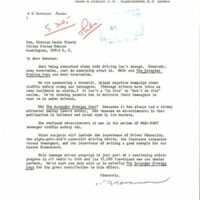 In all, the act required the establishment federal motor vehicle safety standards for all new domestic and imported vehicles by January 31, 1968 that would go into effect within a year of publication. 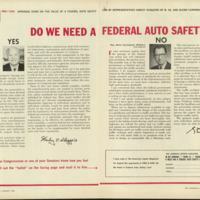 Federal standards for used cars were to be developed and instituted within two years. 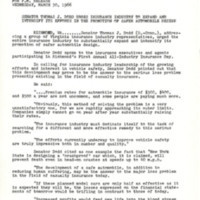 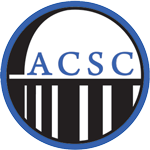 The new law also addressed specific concerns about tire safety by directing the Secretary of Commerce to establish a uniform system for grading tire quality and requiring safety information on all tire labels. 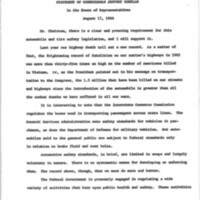 Finally, the Motor Vehicle Safety Act required manufacturers to notify dealers, purchasers, and the Secretary of Commerce of safety-related defects on their products and to pay for the cost of repairs.